Wood and tin automobile model of a Buick sedan. Car has movable parts. Harold Kooken of Waverly, Kansas, made this model. 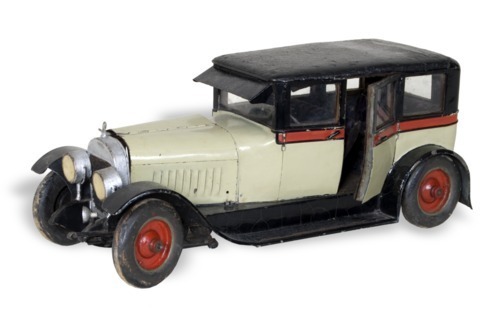 Kooken made car models from scraps found on his grandmother's farm. He took up model making as a way to pass time during childhood due to a heart condition that limited physical activity. Kooken and a friend also made a detailed model of a Cord automobile. It was taken to a Detroit auto show in 1932 and seen by a General Motors staffer who was impressed with the work. Kooken was hired by the company, and is alleged to have helped design the 1934 Chevrolets.